Webtrends helps companies make sense of their customer data to drive digital marketing success. Users have the ability to observe, analyze and deliver insights on the visitor journey across web, social, mobile and SharePoint channels. With the release of the Webtrends content pack, users will now have the ability to use Power BI to monitor, analyze, and visualize their Webtrends analytics data. The out-of-the-box content enables users to connect and begin to discover insights immediately. 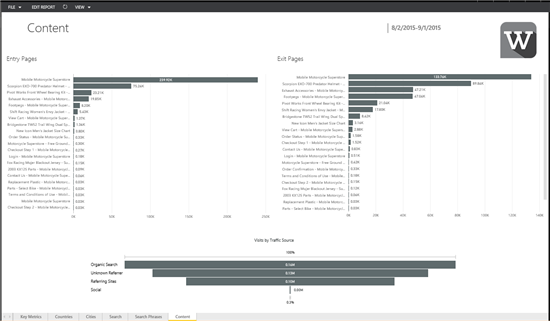 This post will provide an overview on how the Power BI content pack helps users visualize and draw insights from Webtrends data. 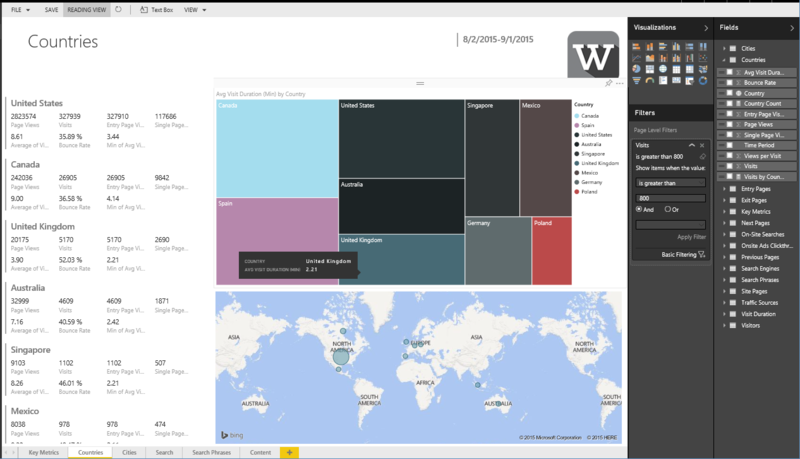 For additional details on how to get started, please see the Webtrends content pack for Power BI help page. After connecting to your Webtrends account, your data will begin loading into Power BI. Once the content pack is loaded, you can interact with any of the out of box content such as the dashboard or reports. Clicking on the tiles will drill into the 6-page report built on top of the data set. For example, the Visits by Traffic Source tile leads to the Content report, where you can view key metrics such as the top traffic sources and how users and entering and exiting your site. You can use the tabs at the bottom of the report to navigate between pages. Each visualization was chosen to provide unique insights and to highlight important metrics about the data. You can hover over any of the visualizations to see additional details about that specific data point. You can also customize reports by switching to edit mode on an individual report. From edit mode you can view all of the tables and fields that are included in the dataset. You can add filters, rearrange or modify existing visuals, and create new visualizations. For example, on the Countries report you can add a filter to only show countries that are producing more than 800 visits in the last month. From each report you have the ability to pin visualizations back to the dashboard to further customize it. You can pin a visualization by hovering over it and selecting the pin icon in the top corner. On the dashboard you can edit the size, location, and presence of each tile or visualization. This allows you to tailor the reports and dashboard to your unique needs. After you initially import the data all the content including the dashboard, reports and data set will continue to update daily. You can control the refresh schedule on the data set as well. 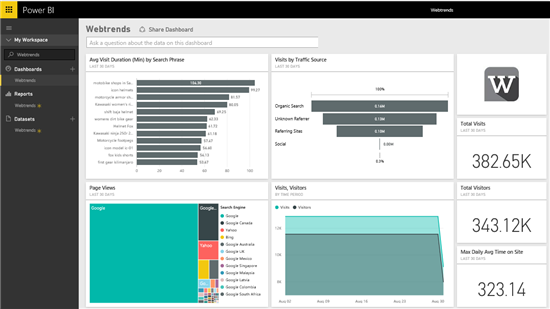 With the Webtrends content pack for Power BI, you have an initial set of metrics and insights to help explore your data even further.